Nicola takes the Courtmacsherry challenge! 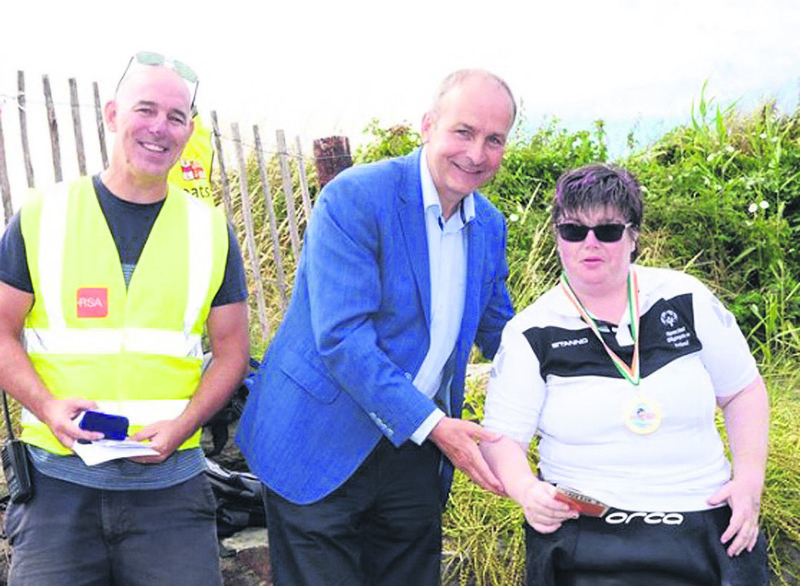 Nicola Dwyer being presented with the RNLI medal by Micheal Martin, with Ray McCardle, swim organiser, after completing the 1500m open water swim at Courtmacsherry on 21st July. Nicola is a member of Mallow Marlins Specials Olympics. Nicola Dwyer, a member of Mallow Marlins Special Olympics, took part in her first mainstream open water swim last Saturday week, 21st July, when she completed the 1500m open water swim at Courtmacsherry. 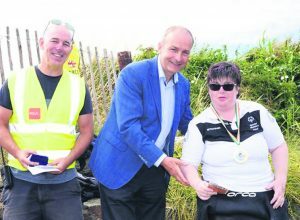 After the swim, Nicola was presented with an RNLI medal by Fianna Fail leader Micheal Martin, and last weekend completed a one kilometre swim at Garnish Island. Nicola has trained hard to achieve these results and all in Mallow Marlins are hoping that it will inspire other members of the swim group to take to the open water. Congrats, Nicola!